French jurisconsult; born at Aix, in Provence, in 1804; died there Feb. 4, 1882. He studied law at the Aix University; and with great promise began in 1825 the practise of law in his native town. In 1847 he was made leader of the bar (bâtonnier) of Aix. After the Revolution of 1848 he was appointed mayor of Aix and counselor-general of the department of Bouches-du-Rhône. But he soon gave up his public functions to devote himself to writing. Under the general title "Droit Commercial, Commentaire du Code de Commerce," he published, between 1856 and 1867, a series of treatises on commercial law, in eighteen volumes, which constitute a complete account of all the matter found in the Commercial Code. Bédarride's other works upon law are: "Traité du Dol et de la Fraude en Matière Civile et Commerciale," 3 vols., 1852; "République, Monarchie," 1873; and "Commentaire de la Loi du 14 Juin, 1865, sur les Chèques," 1876. 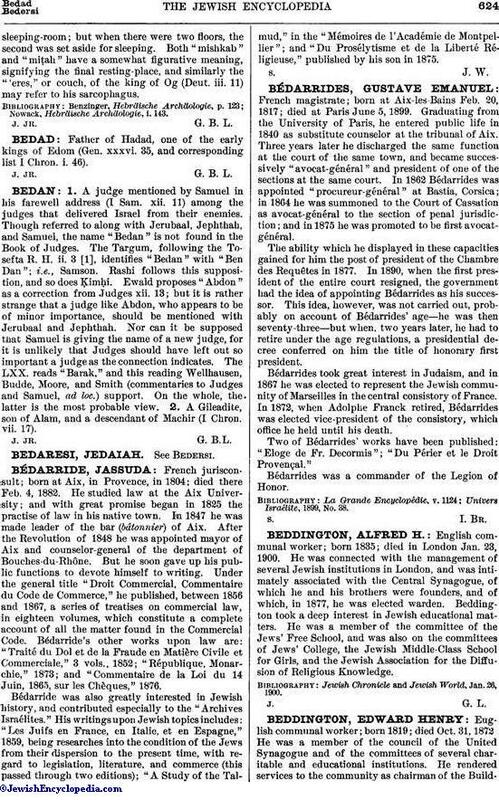 Bédarride was also greatly interested in Jewish history, and contributed especially to the "Archives Israélites." His writings upon Jewish topics includes: "Les Juifs en France, en Italie, et en Espagne," 1859, being researches into the condition of the Jews from their dispersion to the present time, with regard to legislation, literature, and commerce (this passed through two editions); "A Study of the Talmud," in the "Mémoires de l'Académie de Montpellier"; and "Du Prosélytisme et de la Liberté Réligieuse," published by his son in 1875.